Ruben Amaro is a ninja—except when his email blasts on free agency signings find their way into the wrong hands. A reader forwards along this missive, purportedly from Ruben Amaro to the front office announcing that the Phillies are signing Dontrelle Willis to a one-year deal pending a physical. Because our reader has an email address similar to someone with the team, he says he occasionally gets official-looking correspondence like this. 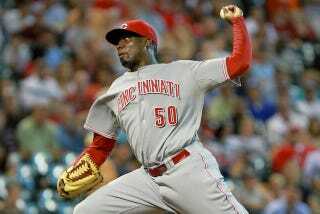 We have come to an agreement on a non guaranteed one year major league contract with lhp Dontrelle Willis. It is ending a physical exam to hopefully be administered on Thursday. As to the names on that list, Casterioto and Gregg are in communications, Coppenbarger is a clubhouse manager, and Sheridan is the Phillies' head athletic trainer. Kathy Killian, who needs to check her address book, is a Vice President of Human Resources. We're trying to get confirmation on this. In the meantime, Willis is definitely in Philadelphia today.